With October being #sensoryawareness month lets look at messy play. There is nothing better than seeing children be free to explore, experiment through messy play. The learning opportunities are endless being creative, using their imagination and generally challenging themselves. Whether it be playing inside with bubbles, shaving foam, flour or outside in the sand and water play areas at nursery or school. 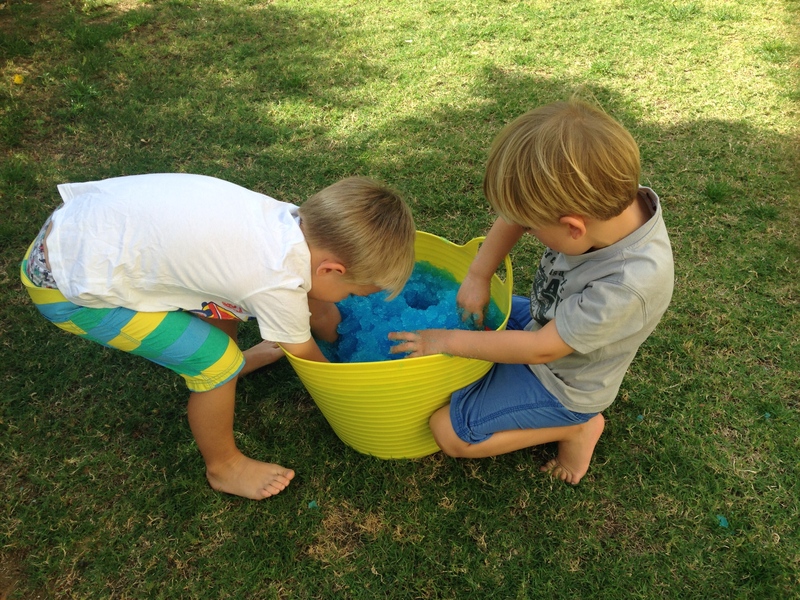 On a hot day my son loves to use gelli baff which is a like a slime that we place on the trampoline. He hides his toys makes sculptures, just enjoys the cold slime, experimenting ,exploring and developing his senses. What is messy play you ask? Children using all their senses in the process of exploration, especially the sense of touch  offering children plenty of opportunity to mould and manipulate materials  not having a focus on making or producing something. Why is it so important for our children? Messy play offers an amazing opportunity to develop these early motor skills, whether it ís building muscle strength and control in fingers, wrists, arms and shoulders by squishing, squashing and squeezing playdough, or developing muscle control by making marks in shaving foam, clean mud, sand mousse or paint. As well as plenty of opportunities to develop fine motor skills, messy play offers lots of ways to develop gross motor skills, many of which can be based around children interests. Messy play allows children to work together to explore the sensory opportunities you provide whilst building vocabulary as they discover the specific attributes of a slimy dinosaur swamp or crunchy cereals or autumn leaves. It also helps to build confidence and communication skills as children roll car tyres to each other through paint or fill rubber gloves (with holes in) for each other in the water tray. When role-play opportunities are combined with messy play, children build their imaginative language and get plenty of chances to communicate their ideas through their play. Many messy play offerings can be planned to actively encourage cooperative play, to help children to build their social skills as well as to develop their own confidence in approaching unfamiliar situations. By supporting children in their explorations, we help them to explore their feelings about different materials, their likes and dislikes and to build their confidence to express their own ideas and feelings. Taking this into account think of activities that are safe, fun, messy in a safe supportive environment that you could introduce to your students for learning, experimenting and exploring on a daily basis. There are many more websites and free resources online, if you have any suggestions please contact me as we are always looking for new ideas. Also share your experiences with us below. Next Post Characteristics of Effective Learning in Early Years!